It was with sadness that Arbroath Town Mission had to announce the planned closure of their Day Care and Lunch Club services. The Day Care closed on 29th March, at the end of the council contract, whist the Lunch Club closes at the end of April. The home delivery of meals has already ceased. These services have unfortunately been running at a loss for a number of years, and having worked hard over a significant period of time at finding ways to reconcile the financial situation, we were left with no option but to announce their necessary closure. It has been a privilege for us to have the opportunity to provide practical care & companionship as well as a good meal and a sense of community for so many people over the years, and we know many will feel their loss. Unfortunately, it is no-longer viable for us to provide these services in this way. Up until the end of the council contract we have sought to fully co-operate with Angus Council to ensure that the needs of service users are accommodated to the fullest extent practicable and that the service users best interests are protected. Also, as a church we will be looking at how we might continue to show practical love & care to the elderly within our community on a volunteer basis. If you have any questions or would like to speak to someone, please do contact the Mission office 01241 871650.. The Centre and its committed staff offer a wide range of services to the community, particularly for the elderly. You are always welcome to come in and find out more about what’s on offer; bring a friend or just come yourself, and enjoy the companionship of new friends in warm friendly surroundings. Why not come in and enjoy a lovely mid-day meal. We have a set daily 3 course menu of home-made soup, main course and sweet. The weekly menu is displayed on the cafe window and in the main entrance hall. We also operate a meals on wheels service for housebound seniors who require a lunch-time meal. Phone the office (Mon-Fri, 9am-1pm) on 01241 871650 for more information. We have a 16 place day care service for the elderly, where they get picked up by minibus, get their lunchtime meal & have opportunity to engage in a good range of activities throughout the day including crafts & games. For more information about this service contact Wanda Lindsay – Day Centre Manager. Contact via the Office on 01241 871650. ​Join us for a time of singing, jokes and good company, with a short message from the Bible and also including refreshments. The premises have been very considerably extended over the past 25 years to provide a large games hall with balcony, cafe, small kitchen, dining room, sun lounge, front lounge, toilets, office accommodation and large commercial kitchen. The latest addition to the building being the day care unit with its spacious lounge looking onto our beautiful garden enclosed in high sandstone walls and with its own toilet and shower facilities. The premises are well furnished and kept scrupulously clean, with all extensions having been added to the original mission premises where church services are held. 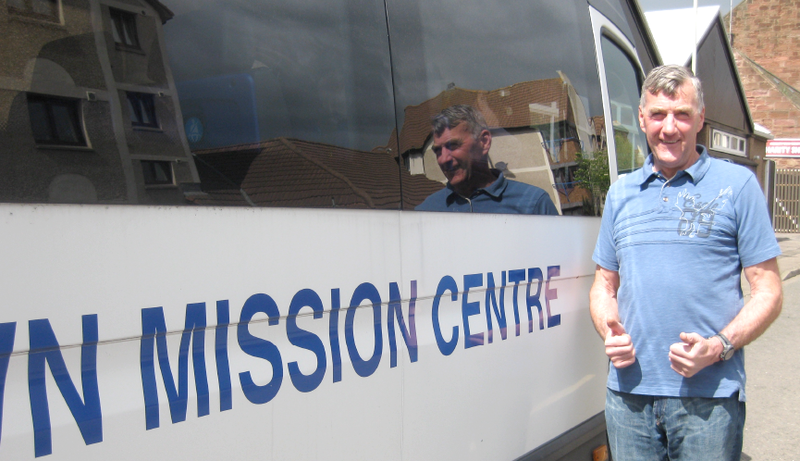 We have a minibus to serve the day centre and another to bring seniors who need transport for the lunch time meal. Angus Council Social Work Department part fund our services, but we require to raise considerable funds for ourselves to meet the high costs of overheads etc. and greatly appreciate all donations made to support the work. We are a registered charity SC047587.